Home ❯ Articles ❯ Can Leo or Simon stir up the current political status quo? The fourth in our series of tracking polls in 2017 depicts a relatively stable political situation in Ireland since January. Fianna Fail continue to lead as the largest party, and will be buoyed by a rise back up to 28% in this month’s poll. This is 4% ahead of their main rivals Fine Gael, who appear to be stuck at 24% support. It is interesting that Fianna Fail appear to do better, when the focus in the media is not on one of their supply and confidence skirmishes with Fine Gael. Despite these gains for Fianna Fail, the reality is that movements have on the whole been within the margin of error for polls on this sample size, and the picture is relatively stable. Since February, Sinn Fein have improved their share, securing between 17-19% of the first preference vote. This month they hit 18% support. It appears that movement at the higher end of their support, is counter balanced by movement in support for Independents. Last month their support fell back somewhat, after a focus of attention on the parties past with the death of Martin McGuinness, with a resulting rise in support for Independents. A month later and the influence of the past is somewhat forgotten, as the party regains some lost ground, and the support for Independent candidates falls back. Of most concern for the future stability of the government is perhaps the decline in support for the Independent Alliance. This group was very conscious when going into government that they did not want to replicate the fortunes of Labour and the Green party before them, where the minority partner suffered during the term of the government. While at the group’s overall level of support, any fluctuations tend to be within margin of error, it will be a worry for them to see support drop back to just 2% in today’s poll, having secured 4% at the last election a year ago. In contrast Labour will be delighted to hold on to 6% support for the second month in a row. While there is still much work to do to regain lost ground for the party, it does suggest they have at least arrested the downward trends seen over the past year. With very little really consistent movement in support for any of the main parties, it is hard to see a general election being called any time soon. So what might change that? Of course the most obvious event on the horizon is the possible change in leadership for Fine Gael and of course the Brexit negotiations. The main contenders for the leadership seen in polls running up today have been Simon Coveney and Leo Varadkar, and today we delve a little deeper into how voters view both candidates. When voters were asked about the leadership credentials of the two candidates Leo Varadkar is ahead on three of the four attributes tested. These include, most importantly, being seen to make the best Taoiseach, where Varadkar secures 40% support vs. 34% for Coveney, with the rest feeling neither would make a good Taoiseach. Among those that expressed a preference that means Varadkar leads Coveney by 8%. Varadkar is unsurprisingly also seen to be the candidate that would lead Irish society to be more socially liberal, with 53% of all voters agreeing with this view, and just 25% suggesting Coveney would be more likely to do this. 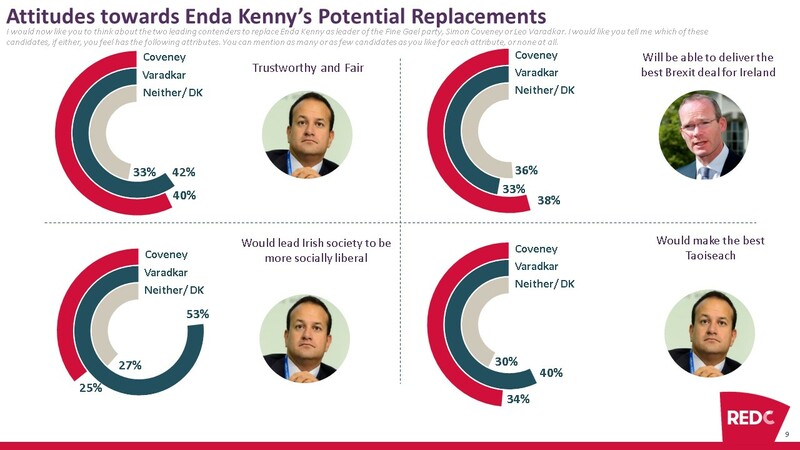 Varadkar is also seen by more voters to be trustworthy and fair. However this is by a much smaller margin of just 2% vs. Coveney, effectively leaving the candidate neck and neck on this characteristic. The final attribute is possibly the most interesting, as Coveney is seen to outperform Varadkar in terms of being the candidate most likely to get the best deal from the Brexit negotiations, by 38% to 33%. Given the importance of these negotiations in the weeks ahead, it is possibly a surprise that this doesn’t do more for Coveney’s overall best Taoiseach ratings. But what does any of this mean in terms of possible impact on overall party support? The data suggests that current Fianna Fail voters are far more likely to prefer Simon Coveney, on all aspects apart from delivering a more socially liberal Ireland. A prospect that is not particularly desirable for a more traditional older Fianna Fail voter profile. However Varadkar does better among Labour, Sinn Fein and Independent voters. It’s likely therefore that whichever candidate becomes leader, they will give Fine Gael a bounce in the polls albeit possibly from different sources. However, understandably there doesn’t appear to be overwhelming support from voters of different parties for either candidate, and as a result is likely this bounce may not do much more than reverse the situation for the two main parties, and even then possibly only for a short honeymoon period. The Fine Gael leadership election therefore will certainly bring interest to the political scene. However, based on current voter perceptions it is quite possible that it may not have enough significant short term impact on the political status quo, to encourage the new Fine Gael leader to hold a General Election any time soon.